Running a service based business (plumbing, carpentry, building or electrician) and need a website, but your confused about the options out there and don’t want to be ripped off? then you’re in the right place. Unlike our competitors, we understand that creating a high converting website for your business could add potentially another few hundred thousand to million on your bottom line each year(depending on your company size). And just like there are cowboy builders, there are also cowboy coders. So we will highlight what we do when we create websites for tradesmen, and how it sets us apart from our competition. Because all of our websites for tradesmen are built custom we take time to make sure that every piece of code that goes into your website needs to be there and if it doesn’t it’s not included. That way the website loads quicker and converts more of your website traffic into customers. Having a fast loading website is very important, especially when most business is done on mobile phones these days. Being mobile responsive (a website that works on a phone) is very important if you want to generate more leads and sales. One of our client’s website is visited 80% of the time by visitors on a mobile phone. 8/10 people browse their website and because it’s not a cheap theme like our competitors sell they are able to make 5x the revenue they were before hiring us. What would you do with 5x the amount of revenue? Being a tradesman most of your time is probably been spent on site (or a yacht if your an electrician), so the last thing you want to do is be distracted from your actual work to update a website that is a nightmare to use. We make websites that are easy to use and update without having to know any coding or be any good with computers. Most of our clients hate computers, so if you do, don’t worry you are not alone. If you want to update the galleries of your latest work then you can do that with ease. If you can work an email you can work a website designed by us. And if you ever get stuck our team of experts are only a phone call or email away. When we design websites for business owners in the trades our ultimate goal is to generate more leads for you. Our website design process is centralised around lead generation. In website design, there is something known as conversion rate optimisation or CRO for short, which basically means the testing of different elements on a website to see which convert at a better rate. So for example, with your future website you would test different headlines, buttons, button text, colours and much more to see what works better when turning website visitors into customers. We have been building websites for over 10 years and optimising them for just as long. Do you think someone who charges £300 for a website knows any of this? nope, I don’t think so. And it’s very important too. Let us say that from our testing we see that 5 out of 100 website visitors contact you for a quote and 2 out of those 5 become customers. We then test our designs to see which converts best for you. With our new designs we are getting 10 out of 100 to contact you and now you are getting 4 clients instead of 2. Without any additional website traffic, you have just doubled your website earnings. If a customer is on average worth £5000, you have now gone from earning £10,000 to £20,000 without any additional website traffic. Now imagine we could increase your traffic too (we can, through SEO). Know how you found this article on Google through searching? That was achieved by something called search engine optimisation or SEO for short. We can do this for you, and we can increase your website traffic in the area in which you work in. So if a customer typed in “plumber in stockport” or “Electrician in Cardiff” we could get your business right on the first page. I’m sure you know how important it is to get on the front page of Google, doing so makes your business visible and will generate highly targeted leads to your website. Our SEO services for tradesman start off at £499 per month and work great for services businesses like yourself when it comes to generating new business for your company. SEO is the modern day equivalent of TV and Radio ads, but unlike them, they are targetted to people who actually want what you are selling. 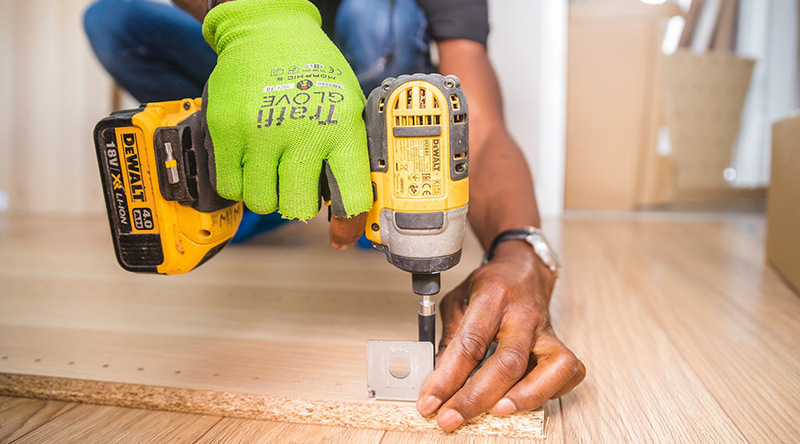 If you’re a tradesman and really want to take your business to the next level I highly recommend our SEO services in addition to our website design. Web design for tradesmen: how much does it cost? Now obviously our websites are more expensive than the people described above, but it’s not like we are going to charge you £30,000. To build a lead generating machine for your business our website design and development services for tradesmen start off at £2500 (or you can join our pay monthly web design package for £99pm). With both packages, you get everything needed to get your website up and running and generating leads for your business. As a tradesman you may not know what you need exactly when it comes to website design, that’s fine. If you came to my house and started talking to me about anything on the tools I wouldn’t have the slightest, that is why we will explain everything in the plainest of terms, we won’t over complicate anything and we certainly won’t rip you off on what you do and don’t need. Simply put, we will build you an awesome website that gets found online. We will make sure that this website works on mobile devices and we will make a website that you are proud to represent your business. If you need a website for your trade business, get in touch. We love working with people who work in the trade as we love being able to increase our client’s bottom line through digital marketing services. Tradesmen website templates – What about those? Sure, as discussed above if you’re looking to have a website design for your business then you can get them done for cheaper than us. But we know that our website design services will pay for themselves. For example. Our competitor – Website design cost £300, leads generated 0.
looking at the above, £300 looks cheap for a website and looks good value. However your potential customers won’t find it as it’s not going to be search engine optimised and as a result, you won’t make any money back from it. Effectively you just threw £300 away. let us say your product is good and your sales team are excellent, from the 10-50 generated new leads you may close 5. Your average sale could be worth £5000. 5 x £5000 = £25,000. Your website could have generated an extra £25,000 per week/month, but if you chose to go for a cheaper option you wouldn’t have even had these enquiries. Not so cheap now is it. Tradesman website design – What’s included? Professional domain name and email addresses. I hope you see the value in working with us, rather than someone who will make you a site and forget about your business as soon as you have completed your payment. If you would like a website designed for your trade business please get in touch, we would love to help improve your website traffic, and lead generation process.